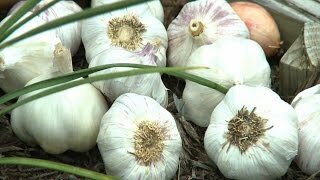 Elephant garlic prefers a long, cool growing season and is best planted in early fall. The larger the planted clove, the larger the bulb it will produce, and these cloves are huge. You'll harvest enormous bulbs that are up to 4" wide and 3" long! Delicious mild flavor. 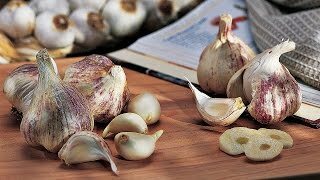 Harvest fall planted garlic the following season, late spring or early summer, about 240 days from planting. Harvest spring planted garlic the same season, about 90 days from planting. Averages 2 cloves per bulb. Garlic, Elephant is rated 3.1 out of 5 by 15. Rated 5 out of 5 by Cokoamojo from Easy to grow I buy burpee vegetable seeds but i get my elephant garlic at a Sprouts store for about $2 each. As long as its organic its fine for planting. I get 3 to 5 cloves per bulb. I plant in mid September and harvest in mid May the following year. Rated 1 out of 5 by tomatthe1 from Won't buy again. Very few cloves to plant, of the 5 or 6 you get they all grew, but only 2 of them were nice big heads similar to the ones I had planted. I won't bother with these again. Rated 1 out of 5 by Garlic lover from Elephant garlic Both batches of elephant garlic were moldy and non of the garlic grew. Maybe they need better control on their garlic provider. Rated 1 out of 5 by Jess84 from Very small Out of the 6 cloves I planted last fall, only 1 survived and it is terribly small. It produced an entire bulb with individual cloves but it is the same size of regular garlic. Rated 2 out of 5 by Jessicaz84 from Low yield Planted 6 cloves last fall. Only 3 have sprouted this spring. I feel like I wasted my money on this to have only 1/2 of them be successful. Rated 5 out of 5 by Chip61 from Consistant producer I have planted Elephant Garlic for over 30 years. We plant at Labor Day and harvest the following 4th of July. Harvest ONLY the plants that have raised a stalk with a large lavender pom-pom blossom. These will have bulbs that have separated into cloves. If they haven't bloomed, you will dig an onion-like bulb. The bulbs we harvest generally have 4 to 6 cloves. I'm not sure that the photograph isn't of regular garlic with more and smaller cloves. Rated 3 out of 5 by GardenerRob23a from Huge Cloves Ok, this definitely wasn't what I was expecting. I was expecting big bulbs with a normal amount of huge cloves. My own fault to not reading up on this. I'm still going to give them a try, but I'm also going to quick order some regular garlic. Read thoroughly before you buy so you know what you are getting. Rated 2 out of 5 by nickwlee12 from Pricey Despite the cloves being very large I expected to receive more than a couple for the price I paid. Also, this did not do well in my area (GA) compared to other varieties.